​Scroll over or click on the funnel chart to get more details of OLG 31 May 2015 financial results. During the financial period under review OLG underwent a restructuring where it sold off non core assets and acquired assets and businesses inline with their core business which is logistics services. OLG sold off Postnet to Aramex (UK). It has also acquired a four small logistics firms known "Jackson and Buffelshoek". While the net profit from continuing operations in the funnel chart above, if all corporate actions are stripped out and one looks at the underlying profit of the core business the profit from the core business amounted to close to R76 000 000 (or 33c a share). Onelogix has always been known as a business with strong cash generating capabilities. This still holds true. OLG generated R130million (from continuing operations). That amounts to roughly 54c per share generated in cash. They currently sit with R159million in cash, which equates to about 66.2c per share. Thats about 20% of OLG's current share price. With fuel prices being relatively low, one suspects current transport rates are not favourable towards logistics companies such as OLG. Higher prices leads to higher margins, lower prices to lower margins. Its therefore no surprise that OLG's share price has been coming down substantially over the last 12 months. But astute investors will know that fuel prices wont remain low forever, and when the tide turns, it might be to late to get into OLG. Below a breakdown of OLG's revenue per division and operating profit per division. Its clear that the abnormal logistics division is the real money spinner for OLG. 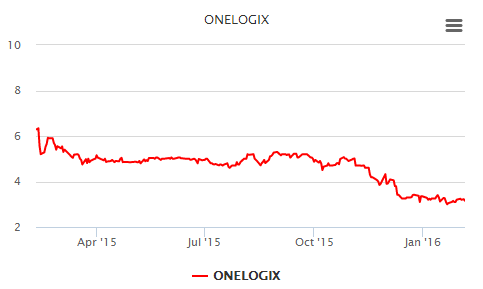 Onelogix is valued at between R4.62 and R4.80. This puts OLG on a PE ratio of 14 and a dividend yield of 3%. 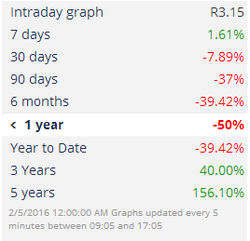 The current price of R3.15 does present an enticing buying opportunity we feel.